The Tu-95 BEAR was perhaps the most successful bomber produced by the Soviet aviation, enjoying long service in a variety of roles and configurations. It was the only bomber deployed by any country to use turbo-prop engines, which provided extraordinarily long endurance at speeds only slightly less than comparable turbojet-powered heavy bombers. Development of the TU-95 intercontinental bomber began in the early 1950s after series production of the medium-range TU-4 started.. Initially, several designs were considered, including a modification of the TU-4 and production of a new aircraft with piston engines. Prototypes of these aircraft were developed and tested from 1949 through 1951, it was concluded that bombers with piston engines could not provide adequate performance for the intercontinental attack mission. 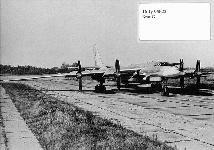 In March 1951 development of the T-4 intercontinental jet bomber began. However, KB Tupolev did not support the development of a bomber with turbojet engines, believing that the proposed AM-3 jet engines would not provide for the required range of more than 10,000 km. As an alternative, KB Tupolev proposed an aircraft with four turbo-prop engines that would provide a range of more than 13,000 km and speeds of more than 800 km/h at altitudes of 10,000 meters. The aircraft-design was designated as "95". The design of the wings drew heavily on the experience gathered by Tupolev and the Central Aerohydrodynamic Institute (TSAGI) during the development of the swept wing TU-16. The wings of the "95" were swept back at an angle of 35 degrees, allowing the placement of a large bomb bay behind of the torsion box of the wings' central unit at the aircraft's center of gravity. The Bear's wings are mid-mounted, swept-back, and tapered with blunt tips. Its engines consist of four turboprops with contrarotating propellers located on the wings. The engine nacelles extend well beyond the wings� leading edges. The fuselage of the Bear is tube-shaped with a rounded nose that tapers to the rear. It also has a stepped cockpit and a tail gun compartment. The tail of the aircraft is a fin that is swept-back and tapered with a square tip. The greatest difficulties during the development were the engines. After studies on different engine combinations and versions, the final design of the aircraft incorporated four turbo-prop engines with a thrust of about 10,000-shp. In the late 1940s, the most powerful turbo-prop engine available was the BK-2 prototype which had significantly less thrust (4800-shp). In the early 1950s OKB-276 N.A. Kuznetsov developed the TV-2 engine and the TV-2F booster engine with a thrust of 6,250-shp. while work on the TV-12 engine with sufficient thrust for the "95" aircraft continued. After consideration of Tupolev's proposals, on 11 July 1951 the government officially approved the development of the "95" aircraft: Two versions were built, one with eight TV-2F engines coupled through the reduction gearbox in four pusher-tractor tandem pairs, and a second version with four TV-12 engines. N.I. Bazenkov became the chief designer of all subsequent TU-95 versions. When he died in 1975, N.V. Kursanov took over as chief designer, and from the end of the 1980s, D.A. Antonov became head of the program. In 1952, the first prototype "95/1", equipped with 8 2TV-2F engines, was built at Plant Nr. 156. The reduction gearbox and the four-blade contra-rotating propellers were developed by OKB-120 headed by K.N. Zhdanov. Each pair generated a thrust of 12,000-shp. The first flight of the "95/1" airplane took place on 12 November 1952, but on 11 May 1953 during its' 17th flight the plane crashed and burned due to an engine fire. The second prototype ("95/2"), equipped with TV-12 engines, was completed in June 1954 with a first flight on 16 February 1955. During tests, while carrying a load of 5000 kg, it reached a range of about 15,000 km, a speed of 993 km/h and a ceiling of 11,300 m. Series production of the aircraft -- now designated as TU-95 -- started in January 1956 at Plant Nr. 18 in Kuibyshev, while production tests were still underway. With the exception of Bear A, all models are equipped with a nose probe for aerial refueling. 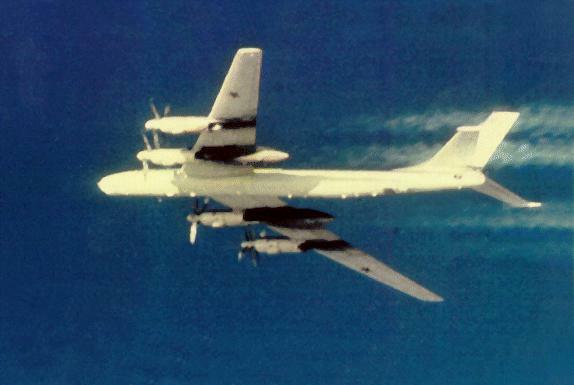 BEAR - TU-95V -- The Tu-95V, built in 1956, was intended to carry large hydrogen bombs. As these bombs were not made operational in the end of the 1950s, this aircraft was used for training purposes. 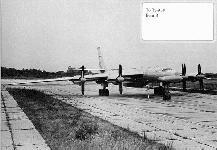 Nevertheless, in 1961, overhaul of a TU-95V aircraft took place at the plant Nr. 18 in Kuibyshev. The aircraft carried the hydrogen bomb that was tested on 31 October 1961, which weighed about 27,500 kg and had a yield of 58 megatons. This version of the BEAR A was apparently not recognized as a distinct variant by Western intelligence, and did not receive a separate designation. BEAR - TU-95N -- In 1958 a single aircraft was converted into the TU-95N used to carry the "PS" attack aircraft "RS" developed by OKB-256 P.V. Tsibina, but this line of development proved unpromising and was soon discontinued. The fact of the existence of this project was apparently not detected at the time by Western intelligence, and this variant did not receive a separate designation in the West. 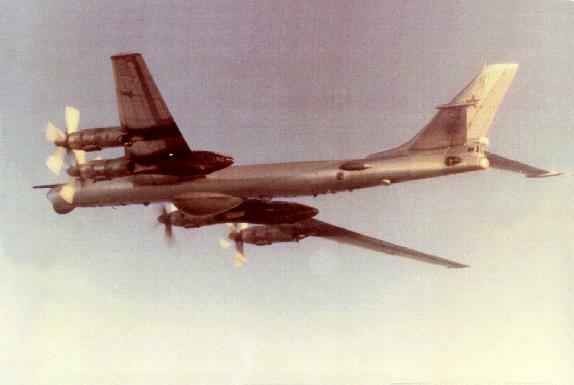 BEAR B - TU-95K / TU-95KD -- The Bear B carried one Kangaroo (350 nm range) air-to-surface missile partially recessed within the aircraft fuselage. The most visible change from the BEAR A TU-95M is the addition of the broad, flat-bottomed radome under the nose, which housed a 3.3-meter wide low I-band A-336Z Crown Drum scanning antenna for the missile guidance radar. Development of the TU-25K-20 weapon system, consisting of the TU-95K and the supersonic Kk-20 (AS-3) air-to-surface missile, began in March 1955. The "K-20" nomenclature appears to encompass both the aircraft and the missile, and the "Tu-95K-20" nomenclature used by some sources may be in error]. With a range of 350 km, sufficient to overcome air defenses, the air-to-surface missile was located under the fuselage. The first flight of the prototype was on 01 January 1956, and through development continued on the missile launch and guidance system, the aircraft's airframe, and the onboard electronics. Series production of the TU-95K began in the spring of 1958, with operational deployment beginning in September 1959. The additional fuel tanks and the missile of the Tu-95K resulted in an increase of weight and drag that reduced the range of the aircraft. This performance deficit had to be offset by a aerial refueling. Work on this "hose-cone" system started in May 1960 and was completed in 1961. The bombers that were outfitted with this air refueling system received the designation Tu-95KD. Some 'Bear-Bs' were relegated to training duties. BEAR C - TU-95KM -- In the 1960s several TU-95K and TU-95KD bombers received a new radio engineering and navigation system, and their designation changed to TU-95KM [some Western sources claim that the Tu-95KM Bear-C was a new-build aircraft, rather than a conversion]. 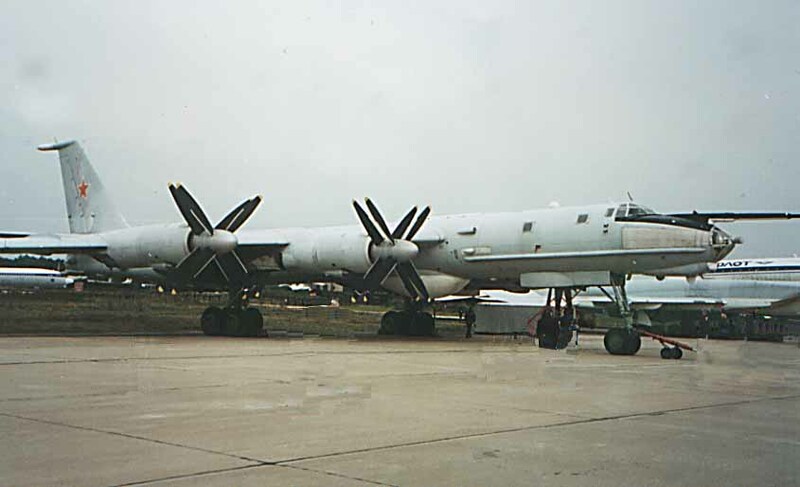 The Bear C is similar in appearance to the late-series Bear B Tu-95KDs, with the addition of two pairs of reconnaissance radomes located on opposite sides of the aft section of the fuselage. Many Tu-95KMs were upgraded to the 'Bear-G' configuration and none are believed to remain operational in the original configuration. 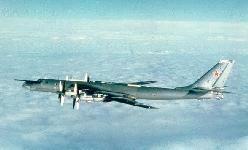 BEAR D - TU-95RTs -- The Bear D is a variant of Bear A which can also perform ELINT reconnaissance. The TU-95RTS maritime reconnaissance aircraft was developed in the early 1960s, and conducted its' first flight test in September 1962, with series production beginning in 1963 [some Western sources suggest that the aircraft were converted from surplus Tu-95M 'Bear-As]. The TU-95RTS began flying with naval aviation in 1964 and was introduced into the operational inventory by spring of 1966. The Bear-D was first identified by Western intelligence in 1967. The new variant was distinguished by a new enlarged chin radome, and a much larger Big Bulge I-band search radar in place of the former weapons bay. This search radar provided mid-course missile guidance, acquiring targets for ship-, submarine- and air-launched missiles. 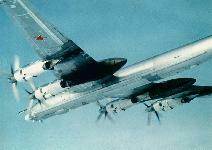 The Tu-95RTs, although built on the airframe of a heavy bomber, was designed and built as a maritime patrol airplane. The TU-95RTs maritime patrol airplanes have not been and are not heavy bombers, nor have they been equipped with air-to-surface weapons or undergone conversion. Tu-95RTs airplanes have external features distinguishing them from heavy bombers of the Tu-95 type: they have no bomb bays, no external carrier beams to suspend or carry aerial bombs or missiles, and no equipment necessary for control of such weapons. Other differences characteristic of these airplanes are the additional three-dimensional radomes of the surface situation surveillance equipment under the fuselage and on the sides of the airplane. 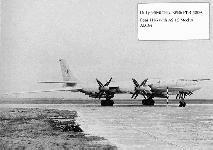 As of mid-1991 the Soviet Union had 37 Tu-95RTs airplanes, which were based only at naval air bases. 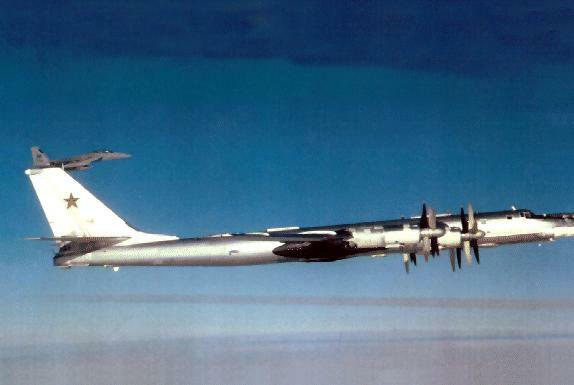 Under the START I Treaty, all Tu-95 variants should be either deployed heavy bombers, non-nuclear heavy bombers, test heavy bombers, training heavy bombers, or former heavy bombers. 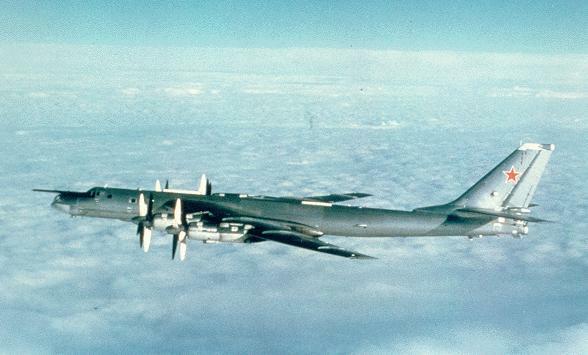 The START II Twelfth Agreed Statement, however, exempts the 37 existing TU-95RTs (Bear D) maritime patrol airplanes from being considered as former heavy bombers. The proposal complements and amplifies that Agreed Statement by providing information on the Tu-95RTs, as well as the opportunity to verify that information. 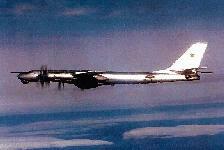 The 31 July 1991 exchange of letters between Ambassadors Brooks and Nazarkin stipulated that the airplanes are for maritime operations, are not heavy bombers, and have not been equipped with air-to-surface weapons or undergone conversion; it also lists distinguishing features for these airplanes and stipulates that the Soviet Union has 37 such airplanes. The 37 airplanes were not to be based at air bases for heavy bombers or former heavy bombers, heavy bomber flight test centers, or training facilities for heavy bombers. They would not be considered to be former heavy bombers and thus would not be "accountable" under the Treaty limits for heavy bombers equipped for non-nuclear armaments, training heavy bombers, and former heavy bombers. In the event the Soviet Union continued to produce such airplanes, all such new airplanes would be treated as former heavy bombers under the Treaty and subject to inspection to confirm that they are not equipped for air-to-surface weapons. The Parties agreed that not later than 240 days after signature of the Treaty, the Soviet Union is (i) to provide photographs to aid in the identification of such airplanes, (ii) conduct an exhibition of one such airplane, under specified conditions, and (iii) exhibit, upon request of the United States, the other 36 such airplanes under specified conditions. About 15 were believed to remain in service with the AV-MF in 1994. BEAR E - TU-95U -- The Bear E is a variant of Bear A modified to perform photoreconnaissance. According to Western sources about 12 were produced for Naval Aviation by conversion of surplous Tu-95Ms. 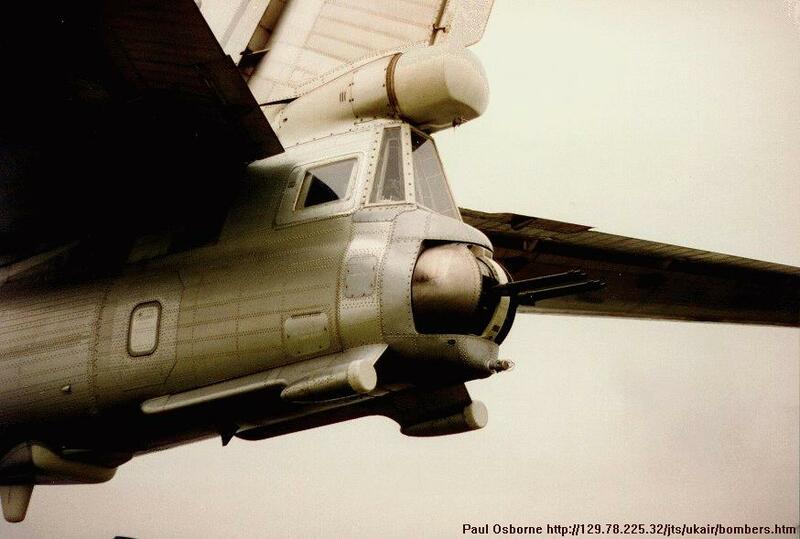 The aircraft features a slightly bulged removeable reconnaissance pallet in the former bomb bay, with seven camera windows -- three side-by-side pairs of windows forward with a single window further aft to starboard. 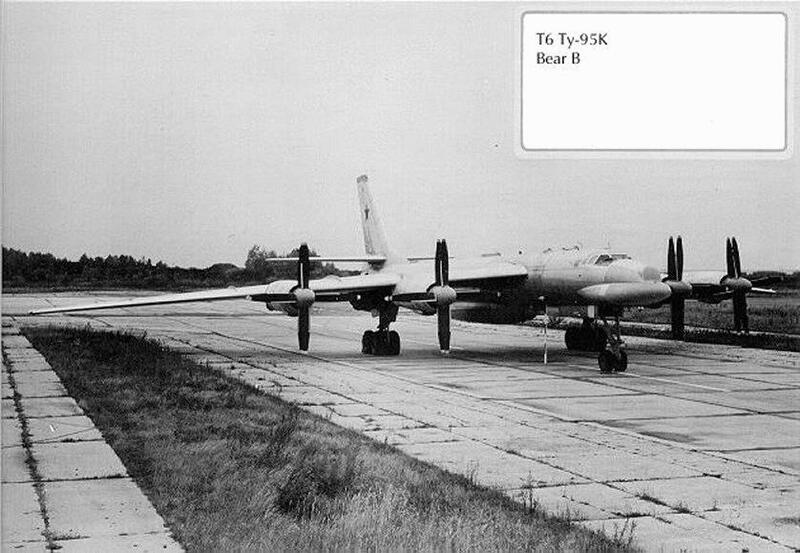 Under the START I agreement, the Parties agreed that all airplanes formerly known to the United States of America as Bear E and now known as Bear T, which are designated by the Union of Soviet Socialist Republics as Tu-95U, were to be considered to be training heavy bombers. Red bands are painted around the rear fuselage for verification purposes. BEAR F - TU-142 / TU-142M -- Bear F exists in two major versions with differing numbers of radomes, consisting of at least four distinct variants [up to at least the Bear-F Mod IV]. The mission of the Bear F is the detection and destruction of submarines. Development of the Tu-142 maritime reconnaissance aircraft began in the mid-1960s, soon after the initiation of the BEAR D Tu-95RTS. Design changes include a new cockpit and slightly longer nose' along with a new undercarriage (with bulged undercarriage doors) and an extended-chord rudder. The Tu-142 lacks dorsal and ventral gun turrets. This upgraded version of the TU-95RTS, with more powerful NK-12MV engines, began flight tests in the summer of 1968 and was deployed with naval aviation in December 1972. According to Russian sources, series production took place at the plant Nr. 18 in Kuibyshev and from the mid-1970s at Plant Nr. 86 in Taganrog. Western sources report that the production line at Taganrog reopened in 1983 to build the Bear-F and Bear-H. Upgrading of the TU-142 in 1972 resulted in the TU-142M, used for anti-submarine warfare. The first flight of the TU-142M [Bear F Mod 2 ] was on 04 November 1975, and deployment to the Soviet Naval Aviation began in 1980. The Tu-142M2 [Bear-F Mod 3], which entered service around 1982, featured a new MAD in a spike-like tail fairing and a lengthened sonobuoy bay. The Tu-142M3 [Bear-F Mod 4] incorporated a new undernose sensor pacakge. First identified by Western intelligence in 1986, the Bear-F Mod 4 remained in low volume production at the end of the 1990s. The Tu-142 (Bear F) antisubmarine warfare patrol airplanes, although designated by the Soviet Union as a separate type of airplane from the Tu-95, have a design essentially identical to the design of the Tu-95 heavy bomber. Under the START I agreement, all airplanes designated by the Union of Soviet Socialist Republics as Tu-142, which are known to the United States of America as Bear F or Bear J, depending on how a particular airplane is equipped, were not considered to be former heavy bombers. BEAR F - TU-142LL -- At least one 'Bear-F' was converted to serve as an engine testbed , with the test engine mounted in a semi-retractable cradle under the center-section. BEAR - TU-95K5 -- In 1976-1977 work began on developing a new Bear modification, the TU-95K-5, that was supposed to carry two KSR-5 [AS-6 KINGFISH] missiles. However, all activities soon halted due to a decision to produce the TU-95K-22, and the development of the TU-95MS aircraft. The fact of the existence of this design project was not detected at the time by Western intelligence, and this variant did not receive a separate designation in the West, since it did not enter flight tests or production. BEAR G - TU-95K22 -- In the early 1970s work began on equipping older existing TU-95K and TU-95KD bombers with Kh-22 air-to-surface missiles and the guidance systems that were used on the Backfire bombers. 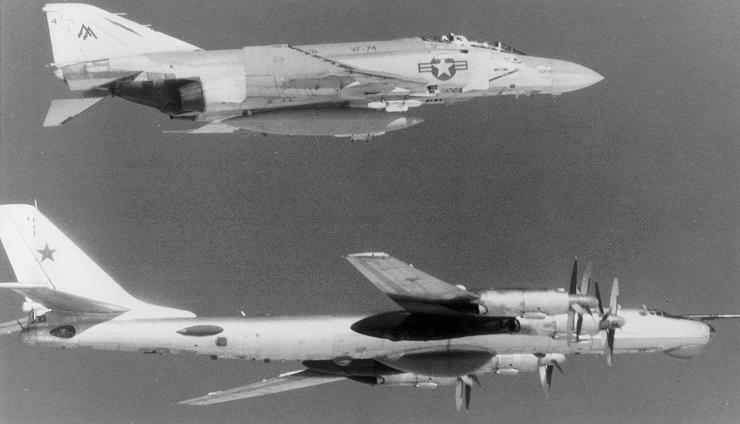 These older BEAR aircraft configured to carry air-to-surface missiles (ASMs) were reconfigured to carry the new supersonic AS-4 missile in place of the subsonic AS-3. 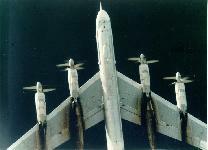 These bombers received the designation TU-95K-22 and carried either one Kh-22M missile under the fuselage or two Kh-22H missiles on pylons underneath the wings. The broad flat nose radome differs in detail from that of the Bear-B and Bear-C, and accommodates the antenna for the Down Beat guidance radar for the Kh-22. The comprehensive defensive avionics suite is evidenced by the numerous radomes and fairings on the fuselage, marking a fundamental shift in survivability ideology. The self-defence armament is correspondingly reduced compared to earlier models. An extended tailcone replaced the tail turret and the dorsal turret was removed entirely, leaving only a single ventral gun turret. 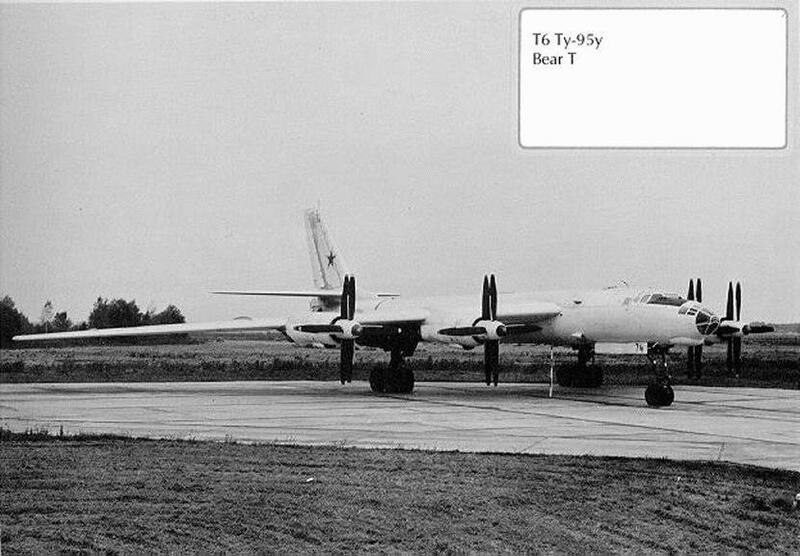 First flight tests of the TU-95K-22 took place in October 1975 and by the end of the 1970s re-equipment of the TU-95K started. 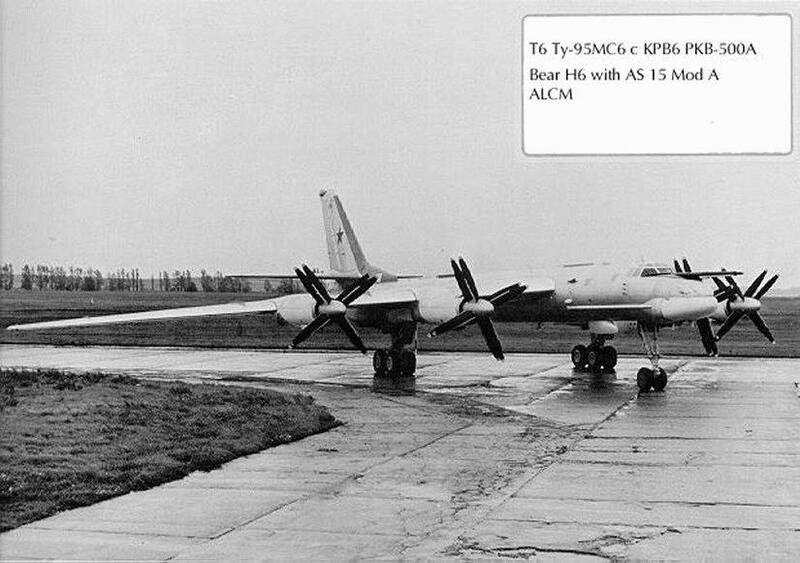 After operation testing, the TU-95K-22 was introduced into the active inventory in 1982. Several of these reconfigurations (BEAR G) had been completed by 1985. By 1998 more than 45 of these reconfigured aircraft were operational. 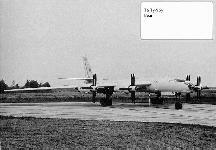 BEAR - TU-95M-55 -- In the middle of the 1970s work on the Kh-55 long rang air-to-surface missile started. Originally planned for deployment on the new TU-160 supersonic bombers, studies were conducted to outfit the TU-95 with the Kh-55. 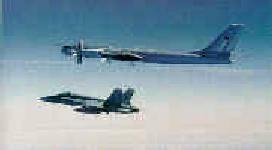 The tests of TU-95 bombers outfitted with Kh-55 missiles, designated Tu-95M-55, started in 1978. After their completion, the project was rejected and development of a new Tu-95MS aircraft to carry the Kh-55 missiles was initiated. It is unclear whether the fact of the existence of this design project was detected at the time by Western intelligence, and in any event this variant did not receive a separate designation in the West. BEAR H - TU-95MS -- The Tu-95MS aircraft is based on the Tu-142 and thus differs in a number of details from the TU-95. The nose of the Tu-95MS is similar to that of the Bear-C and Bear-G, but with a deeper, shorter radome, cable ducts running back along both sides of the fuselage. It lacks the 178-cm forward fuselage plug of the maritime Tu-142, and retains the shorter fin and horizontal, undrooped refuelling probe of prevoius bomber variants. The rear gun turret is a new design, with a single twin-barrelled GSh-23L cannon in place of the pair of single-barrel NR-23s carried on earlier models. After carrying out successful tests, the first of which was in September 1979, series production started in 1981. With the reopening of the BEAR production line, the Soviets began producing a new, upgraded variant of the BEAR turboprop bomber, thereby increasing their long-range bomber force. This entirely new variant of the BEAR bomber - the BEAR H - became the launch platform for the long-range Kh-55 [AS-15] air-launched cruise missile. 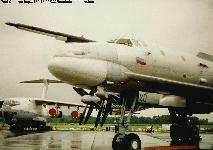 The initial version carried Kh-55 air-to-surface missiles located in the bomb bay on a catapult. This was the first new production of a strike version of the BEAR airframe since the 1960s. With the BEAR H in series production, the decline in the inventory of BEAR aircraft, characteristic of the late 1970s, was reversed. By 1988 BEAR H bombers were regularly observed simulating attacks against North America. BEAR H6 - TU-95MS6 -- The version designated as TU-95MS6 aircraft carried Kh-55 air-to-surface missiles located in the bomb bay on a rotary launcher. 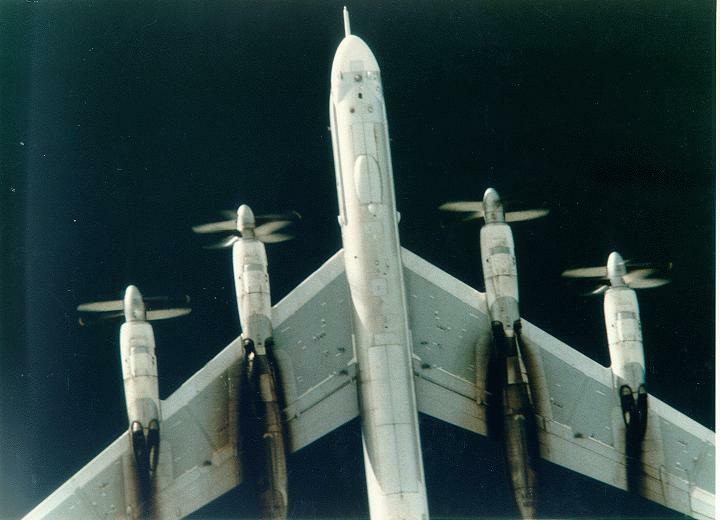 BEAR H16 - TU-95MS16 -- The TU-95MS16 carried six missiles inside the fuselage and 10 missiles underneath the wings. Three underwing pylons are fitted under each inner wing panel, the outboard pair carrying three missiles and the other two single missiles. BEAR J - TU-142MR -- The TU-142MR was a further modification of the Tu-142M used for submarine communication relay, allowing national command authorities and strategic missile-carrying submarines to communicate. The underfuselage search radar has been removed, and the aircraft is equipped with an underfuselage winch pod for a several kilometer long trailing wire antenna. 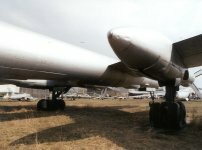 The Tu-142 (Bear J) maritime communications relay airplane, although designated by the Soviet Union as a separate type of airplane from the Tu-95, has a design essentially identical to the design of the Tu-95 heavy bomber. Under the START I agreement, all airplanes designated by the Union of Soviet Socialist Republics as Tu-142, which are known to the United States of America as Bear F or Bear J, depending on how a particular airplane is equipped, were not considered to be former heavy bombers. Russia, Ukraine and India (Bear F) use the Bear. When the START-1 treaty was signed in 1991, 147 bombers and missile carriers still served in the Russian forces: 84 TU-MS and 63 TU-95K-22, TU-95K and TU-95M. 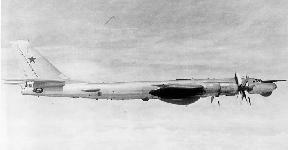 An additional 11 TU-95U were used for training. 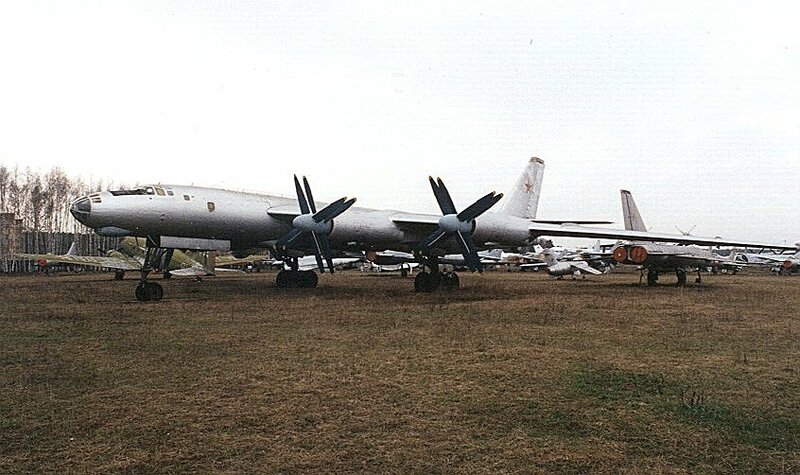 After the dissolution of the Soviet Union, one unit of Bear aircraft remained in Ukraine, with twenty three TU-95MS, one TU-95K and one TU-95M aircraft. These aircraft were passed to Ukraine, and were subject to decommissioning under the provisions of the START-1 treaty. A total of 11 strategic bombers and 600 air-launched missiles exchanged by Ukraine to Russia in payment for the gas debt were transfered in mid-February 2000. Two Tu-160 bombers flew from Priluki in the Ukrainian Chernigov region for the Russian air base in Engels. The missiles were sent to Russia by railroad. Three Tu-95MS bombers and six Tu-160 airplanes had already arrived at Engels since October 1999 in fulfilment of the intergovernmental agreements. Before being moved to Russia, 19 Tu-160 airplanes were stationed at the Priluki airfield and 21 Tu-95MS were located in Uzin. 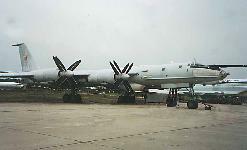 At the time of the breakup of the Soviet Union, thirteen TU-95MS-16 and twenty seven TU- 95MS-6 were based in Kazakhstan. Subsequently, all Bear aircraft located in Kazakhstan were transferred to Russia. Russian Tu-95 and TU-95MS aircraft are now deployed at two air bases A total of nineteen TU-95MS16 and two TU-MS6, operating in the 121st heavy bomber air regiment, which forms part of the 22nd Air Division that is headquarteed in Engels Air Base in the Moscow region. At the Ukrainka airbase (73th Heavy Bomber Air Division) at Svobodny, there are 16 TU-95MS16 and 26 TU-95MS6 bombers that were redeployed from the Dolon airbase at Semipalatinsk in Kazakhstan. 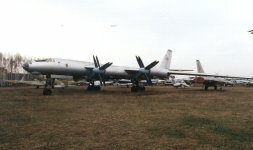 The TU-95K-22 bombers are subject to decommisioning. In early 1997 five TU-95K-22 were decommissioned and re-equipped in Zngyelse, and five at the Ryazan training center. Eight TU-95 are located at the flight-test institute in at Zhukovskiy [Ramenskoye], and one TU-95K aircraft serves as a static display in Ryazan. The TU-95MS, constructed in in the middle and early 1990s, will be operational until 2010 and 2015. Russia is currently working on a new air-to-surface missile to replace the existing Kh-55. 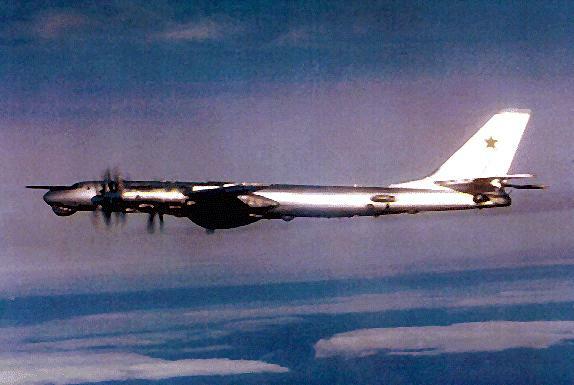 In late June 1999 two TU-95 Bear bombers flew within striking distance of the United States as part of Moscow's largest military exercises since the end of the Cold War. The bombers were intercepted by four US F-15 fighters and a P-3 patrol plane near Iceland and escorted in a clockwise flight around the island. The Bears, and two Blackjacks, were from the Donbass Red Banner 22nd heavy bomber division based at Engels Air Base east of Moscow. They initially flew acoss the central Norwegian Sea. When they got about halfway across, the Blackjacks split off from the Bears and flew along the Norwegian coastline. 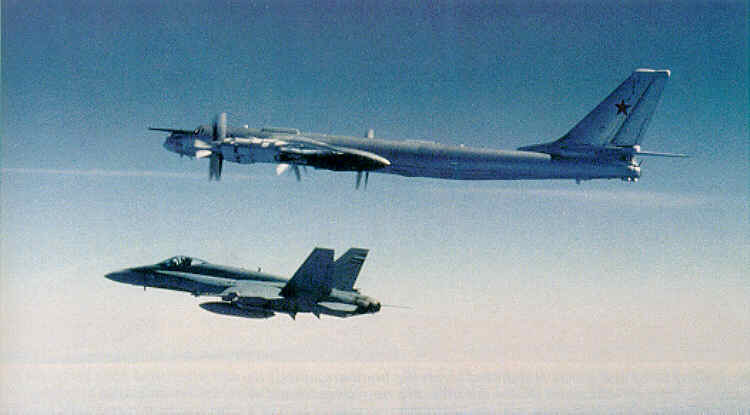 On 16 September 1999 a pair of Russian Tu-95 Bear bombers were detected by the US Air Force headed toward the Alaska coast. U.S. fighter jets were sent to intercept the aircraft which had been caught on radar. Air Force officials said both bombers turned before crossing into US airspace and about 90 miles from the approaching fighters. The Soviet Union regularly tested U.S. air defenses by flying toward Alaska during the Cold War, but this was the first time the Air Force had documented it happening since March 1993. Ten Tu-142 entered Indian service in April 1988 for long-range surface surveillance and anti-submarine warfare Negotiations are currently going on with Russia to procure 6 to 8 more Tu-142 aircraft. The aircraft will be probably from refurbished ex-VVS storage stocks. India is making substantial purchases of the Novator 3M-54 Alfa missile to equip Kilo class submarines and its new frigates. It is believed that an air-launched variant will be purchased to arm the Tu-142s currently in service and the six to eight additional aircraft being sought by the Navy. If an air-launched version of the Alfa is procured, it is anticipated that India's Tu-22M3s will eventually be equipped to fire them.